Is How I Met Your Mother really going to break our hearts over its final five episodes? I mean, HIMYM has always been in the heart-breaking business. The death of Marshall’s father. Robin discovering she can’t have kids. Ted getting left at the altar. If there’s been another sitcom on TV over the past decade that can drop the heart-break bomb as stealthily as HIMYM, I haven’t seen it. So here it is: After spending nine years telling us the story about how Ted met his future wife and mother of his children, is HIMYM going to kill her off in its final few weeks? I was actually having this conversation with a few friends just this past weekend. There’s been the sense that something bad (or at least super emotional) is going to happen in HIMYM’s finale. In a recent interview with Esquire, Cobie Smulders told the magazine that when HIMYM co-creator Craig Thomas revealed the show’s end to her, she couldn’t handle it, saying, “I lost it. I had to leave. … I totally lost it.” So in our conversation about how HIMYM’s finale could cause Smulders to lose it, we almost immediately dismissed the idea of The Mother dying. We had to, right? Of all the theories surrounding HIMYM, the theory that The Mother was dead and that was why Ted was telling his kids this story is one of the oldest. Jason Segel himself even addressed this theory in a 2010 interview with GQ. A theory this old and this widespread couldn’t be the much-guarded ending to HIMYM … right? After “Vesuvius,” it’s getting harder to dismiss that theory. I have a Google Doc full of notes and quotes from this episode, but there are only two parts that really matter. Things started to get weird when The Mother, during a flashforward to Ted and her back at the Farhampton Inn in 2024, told Ted “You’re the love of my life, pooh bear. I just worry about you. I don’t want you to be the guy who lives in his stories. Life only moves forward.” OK, a bit of life advice, but why? Why would Ted and The Mother, a seemingly happy couple with two children, bring up worrying about Ted getting stuck in the past and becoming unable to move forward? Then there was the moment when Ted, noting how the gang was choosing to watch a movie instead of dealing with the fact that the wedding weekend could be the last time they were all together, told The Mother, “it’s funny, in a moment when what’s really happening is too intense to deal with, sometimes it’s best …” “… To leave it unspoken … and just enjoy each other’s company instead,” The Mother finished. Wait. What’s left best unspoken between Ted and The Mother in 2024? Despite Lily’s best efforts, Robin just didn’t seem to care that it was her wedding day. On the way to the ice machine, though, Robin ran into her mom — the very mom who wasn’t coming to her wedding. While 2024 Ted seemed excited about the ending to his story of how Robin’s mother came to her wedding, The Mother wasn’t moved. Of course that was the surprise ending to the story, she scoffed. “What mother is going to miss her daughter’s wedding?” The Mother asked. And then we looked at Ted. Tears in his eyes. Choked up. Unable to answer his wife. The woman he spent so much time searching and hoping for. Is this HIMYM telling us that The Mother won’t be around long enough to see Penny, her daughter, get married someday? Like the volcano that wiped out two entire cities in ancient Greece, did this episode just bury the happy life that Ted had always dreamed of? After watching “Vesuvius,” I talked to a few other HIMYM diehards about what this episode could mean. Another explanation that kept coming up was that maybe it was Ted’s mom who was going to pass away. Of course, this doesn’t make sense when being applied to Ted, because Ted’s not a daughter. Could Ted’s sister, Heather, be getting married? Sure, I guess, but is that really how HIMYM would end? That would be big twist? Ted is telling his kids the story of how he met their mother because his mother passed away before their aunt’s wedding? C’mon. Remember that episode? Remember the end, when a teary Ted had the following to say to his future wife? When “The Time Travelers” aired, there was a lot of discussion over what that soliloquy meant. Was Ted telling his children this story because The Mother was dead? Was Ted the one who died and someone else was sharing his story? After seeing “Vesuvius,” one of the theories certainly has a lot more weight now. Sure, maybe Ted’s speech in “The Time Travelers” and the ending of “Vesuvius” have nothing to do with each other, but is that really the most likely case? When I broke these theories down last year, I originally nixed both the “The Mother is dead” and “Ted is dead” theories, citing Occam’s Razor. The simplest explanation is often the correct explanation, and back then that was the case. If I’m sticking to Occam’s Razor still, it’s now a lot harder to debunk the “The Mother is dead” theory. “You know what I’d do, kids,” Ted tells his children in “The Time Travelers.” With Ted telling this story in 2030 and under the idea that The Mother passes away in 2024, Penny and Luke have spent six years living with the loss of their mother. They’ve watched their father try to move on, but it’s clear that despite his wife’s warning, Ted’s been “the guy who lives in his stories.” Those kids wouldn’t even question why the first thing Ted would’ve done that night in 2013 instead of going to Robots vs. Wrestlers or hanging out with his friends would have been going to The Mother’s apartment in hopes of getting 45 more days — or even 45 more seconds — with her. OK, so let’s go with the theory that The Mother has passed away in the years before Ted is telling his kids the story of how they met. Let’s assume that their trip to the Farhampton Inn in 2024 was their final time before she lost her battle with cancer or whatever illness was enough to cause Ted to choke up at the thought that The Mother wouldn’t be around when Penny someday got married. Where’s the happy ending? I said this last time I broke down these various death theories, and I’m going to say it again: HIMYM has always been about hope. No matter how dark things look for Ted, he’s always held onto the hope that things will work out. When we saw The Mother’s backstory in “How Your Mother Met Me,” we learned that before she fell in love with Ted, The Mother had to move past the death of the love of her life. There’s a chance that Ted is going to have to do the same. Cobie Smulders may have wanted Annette Bening to play Robin’s mom, but Tracy Ullman is still a pretty good catch. Marshall eventually joined in on Robin and Lily’s storyline upon realizing that Stella’s ex-husband had included him in The Wedding Bride Too! through the character Narshall. Apparently the story of Ted getting ticked at Marshall for eating his cake was not only true but also good enough to be included in the esteemed The Wedding Bride movie series. 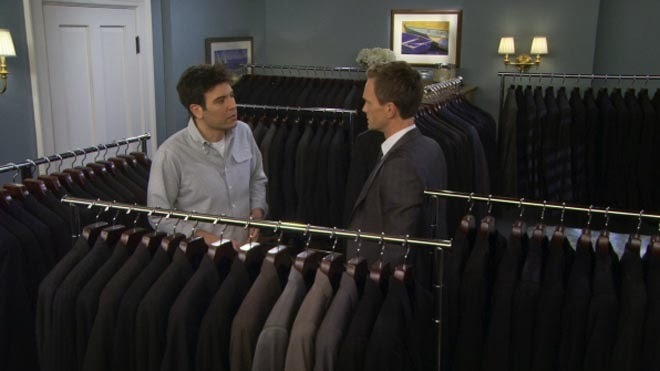 Barney spent the episode trying to find the perfect suit, complaining that the suit Tim Gunn had made for the wedding didn’t fit him right. After going through two hotel rooms of suits, Ted finally convinced Barney to give Gunn’s suit a try. We learned that The Mother has a friend nicknamed Dong Nose.